Belarus: Medical school/student training. PRIME tutors have participated in the annual student camps. Belgium: PRIME has been in touch with a new group for Christians working in healthcare and a PRIME tutor from Portugal represented PRIME and gave a key note lecture at their first conference. Bulgaria: PRIME has worked with the University of Sofia Medical School and the Association of Medical Students to teach clinical skills, clinical topics, the doctor-patient relationship, basic consultation and communications skills - all with a modern patient-centred perspective. We have also run a course on teaching and learning which included sessions on problem based learning, how to learn where there is no teacher, and enabling students learning. Czech Republic: Medical school/student training, nurse training and supporting a ground breaking spiritual care programme in a major hospital. PRIME tutors taught at the national CMA conference and are supporting faculty members at the Charles University Hospital. The medical school student groups are considering running Values Added programmes. 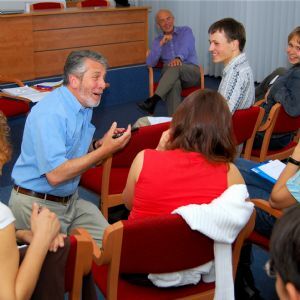 Estonia: Whole person and communication skills training at a national conference for physicians and developing links with the national palliative care association. Georgia: PRIME has contributed to the first ICMDA caucasus meeting, delivering sessions on compassion, whole person, patient-centred and spiritual care, and the and the first Christian Medical Association of Georgia conference. In May 2016 a team of three travelled to Batumi to facilitate a palliative care conference with our local partner, which was attended by 30 people and well evaluated. We hope to returning to the country in 2018 to continue face-to-face training and support as our partners there develop a palliative care service. Hungary: PRIME participated in the healthcare stream of the Hope for Europe 2011 conference. Presentations on the work of PRIME and the need to heal the dualistic divide by engaging with theological education as well as medical education were both well received and endorsed. Kosovo: A PRIME team from Albania and the UK contributed to a palliative care conference organised by UK Aid and Smile International. PRIME tutors participated in an EU-funded programme to evaluate, develop and train the trainers in Kosovo. PRIME provided the main tutors at Kosovo's first conference on palliative care. Moldova: A specialist PRIME team delivered a cerebral palsy training programme for volunteer agencies and staff working with disabled children. A number of new programme requests are being explored. Netherland:A team of senior PRIME personnel ran a PRIME stream as part of the pre-conference programme of the ICMDA World Congress and led a seminar programme during the main conference for juniors and students. Portugal: PRIME has delivered a number of teaching programmes in Portugal focusing on values and whole person medicine. Portuguese PRIME tutors have already developed and led a programme in Mozambique and run a very well received conference entitled 'Global Health: Challenges and Opportunities in Africa' in conjunction with a Portuguese NGO, Assistencia Medica International. Our Portuguese tutors gave a PRIME whole person medicine presentation at the XIX ACEPS Annual Conference and are planning a variety of programmes and events in Portuguese speaking countries. Scandinavia: Colleagues from Norway, Sweden and the UK ran a regional PRIME conference aimed at spreading the message of whole person care and developing PRIME tutors from various countries. A team of tutors in the region is developing slowly with one more experienced individual contributing to the teaching team at our 2015 Annual Conference. Serbia: Medical school/student training. PRIME tutors have participate in annual medical professional conference and medical student summer camps for many years. PRIME teaching materials are used by a Serbian Theological College as part of their programme and we are exploring new opportunities. Spain: PRIME ran a regional conference in Malaga, which included initial tutor training. We were also represented at the NCFI European Conference in Madrid in 2015.